Abstract: Experiments on ultracold atoms provide novel systems to explore many-particle physics. 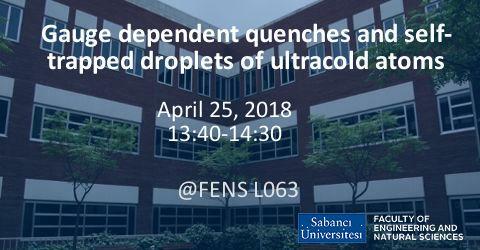 In this talk we will present our results on two separate systems which test the boundaries of well accepted theoretical models. As the first model we consider a one dimensional ladder system under an artificial magnetic flux and investigate the dynamics of the atoms after a sudden change in the effective magnetic field. These ladder systems have recently been realized for both fermions and bosons, and current experiments have the ability to change the effective magnetic field much faster than the time scales of atomic motion in the lattice. We show that such a flux quench creates observable results which depend on the specific gauge choice. We then go on to explain this counter-intuitive result by highlighting the difference between a real electromagnetic field and the effective gauge fields used in cold atom experiments. The second model we consider is the recently observed droplet phases of dipolar bosons. The long range and anisotropic nature of dipolar interaction generally make these systems unstable towards collapse. Over the last two years surprising experiments have revealed that small droplets of these gases can be stabilized by quantum fluctuations. In this novel equilibrium the inward pressure due to dipolar attraction is balanced by beyond mean field (Lee-Huang-Yang) compressibility. So far these systems have been considered only at zero temperature, however we show that the equilibrium is sensitive to not only quantum but also temperature fluctuations. We argue that recent experiments on Dysprosium and Europium are in the regime where temperature effects cannot be neglected and calculate the change in droplet shape with temperature.